Made between 1971 to 1986 by the Arsenal Factory in Kiev, Ukraine. 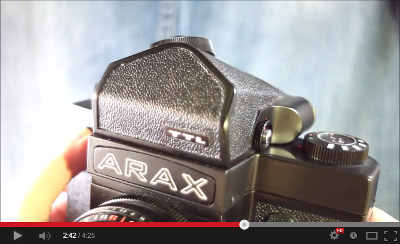 Often referred to as a SLR on steroids because it looks and works like a normal SLR. But it's a medium format camera so it is alot bigger and heavier. The design is based very closely to the Pentacon Six camera and it shares the same lens mount. - 1245g with Waist Level Finder. - 1555g with TTL Pentaprism Prism Finder. Note that most TTL finders are made for the later Kiev 60 which has a little brighter ground glass. And using this on the older 6C might give a slightly inaccurate reading. A common problem with these are however the shutter mechanics at fastest shutter speeds. Another problem is internal reflection which can be caused by just about all the surfaces inside the camera. Some of the bottom and top surface are flat metal which is painted black. These has the most tendency for this but of course if something like this will be a problem depends on a lot. One odd thing is that the shutter button is located at the left side of the camera. Which is not very common but works just as good after some use. All cameras like this also has a big mirror which cases quite a lot of vibrations. This lacks any mirror lock or equivalent so a nice a sturdy tripod is important if you use longer shutter speeds. Not the best camera of this type but on the other hand usually a very cheap one, so you get a lot for your money. Find it very fun to use and can also produce some really nice quality images. Very nice plus is the P6 mount which has a bunch of really good lenses and most of them are quite cheap. 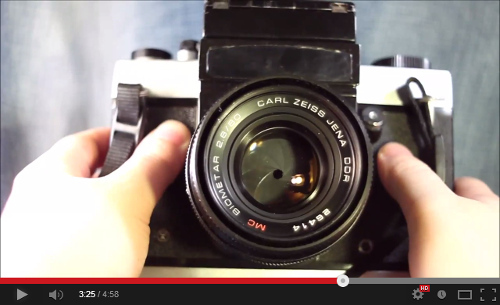 The most popular is the Carl Zeiss lenses which are way cheaper than for most mounts. 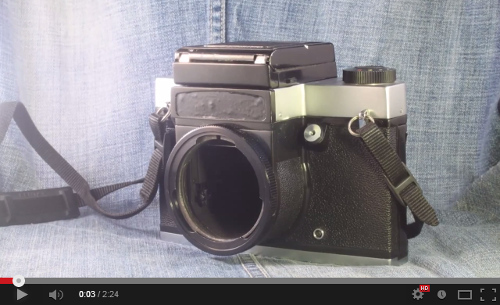 A great camera for anyone that want a cheap medium format SLR. The later Kiev 60 ver is the same camera but with some slight changes. The most useful is a better ground glass with has a split screen and microprism.